One Eternal Day: "He was put into a pie..."
They lived with their Mother in a sand bank, underneath the root of a very big fir-tree. 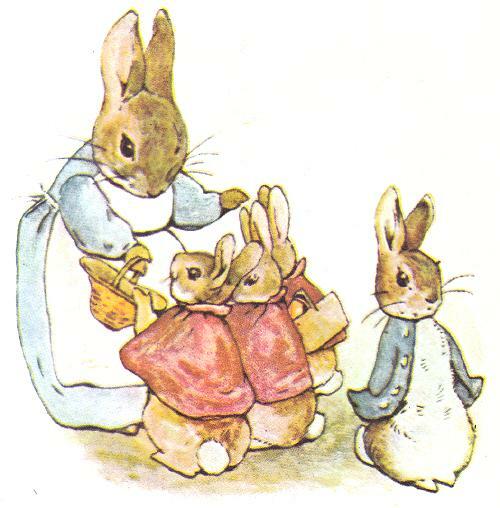 On 2 October 1902 The Tale of Peter Rabbit was published, and was an immediate success. It was followed the next year by The Tale of Squirrel Nutkin and The Tailor of Gloucester.... ...Potter published two or three little books each year: 23 books in all. The last book in this format was Cecily Parsley's Nursery Rhymes in 1922, a collection of favourite rhymes. Although The Tale of Little Pig Robinson was not published until 1930, it had been written much earlier. Potter continued creating her little books until after the First World War, when her energies were increasingly directed toward her farming, sheep-breeding and land conservation. The Free ebooks by Beatrix Potter at ManyBooks.net includes The Tale of Peter Rabbit and six others along with two collections of Potter stories.